Here a circular walk- bordered on both sides by Pleached Lindens - is edged on one side by a low Boxwood hedge & on the other rounded topiary shapes of Box. 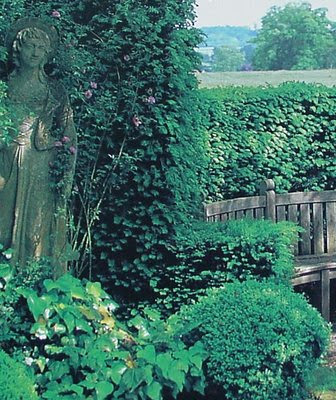 The quality that makes for a good hedge and Topiary Plants are found in relatively a small number of evergreens. 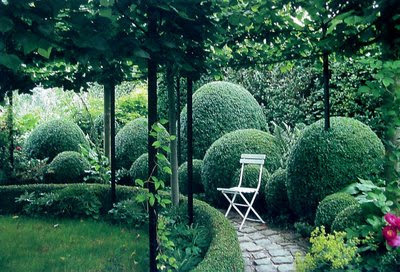 The common Boxwood, known to the Romans, remains a classic for low hedges and med-sized topiary. It's toerant fo many conditions and forms a dense surface when clipped. It's slow growth means that it's shape holds well, even with one trim a year. 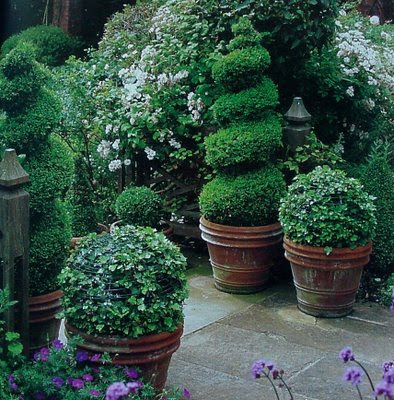 We cherish our three Boxwood Topiaries, which were grown by Robert from cuttings. Each year, We trim them by hand with clippers and they have grown happily in Terra cotta Pots for many years. They can be moved to the Garden, Deck, or Walkway - wherever they get plenty of Sun, Water, & Fertilizer regularly - and they will thrive-!! Small-leaved Ivies on wire frames and Boxwood Spirals. 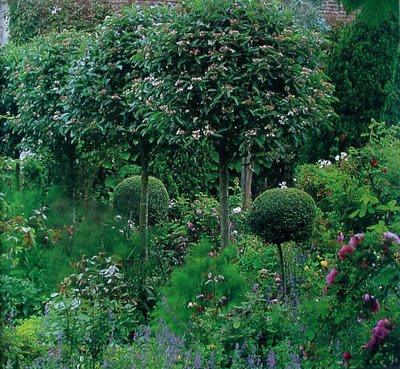 This Garden, shown in late spring, uses the Classic formula of generous planting within a permanent low Boxwood framework. A Wooden Arbor is built down the center of the Garden - to support climbing Roses - how sweet-! 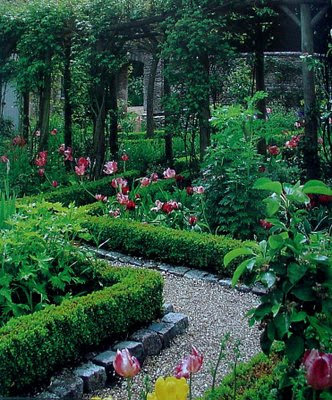 My eye loves to follow the line of the Boxwood hedge as it zig-zags all the way to the back of this Garden - till it reaches that stone archway - which opens to another Enchanting Garden room perhaps-? 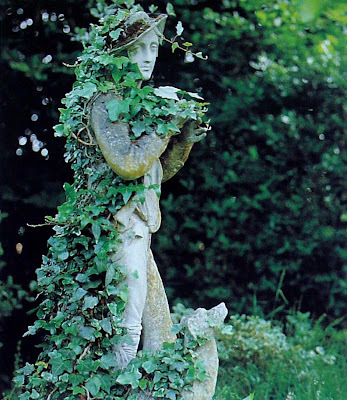 THE BOOK: "Topiary and the Art of Training Plants" By David Joyce - Firefly Books Ltd. 2000. (This is a Great Informative book for anyone who loves Topiary and Gardens -- Buy It-!